Airlines operating in the EU should pay for any increase in their carbon emissions above current levels, the European Commission has proposed. Commissioners called on the industry to make a "fair contribution" to the fight against climate change. But environmentalists said the measures were too weak to make much difference. The commissioners' idea is to bring internal EU flights inside the bloc's emissions trading scheme from 2011, with other flights following in 2012. The aviation industry generally welcomed the plan. "Aviation emissions need to be brought under control, because they are rising very fast," said Environment Commissioner Stavros Dimas. "Since 1990, they have gone up about 90% and, by 2020, they are going to be doubled, if business continues as usual." The commission says 46% of this expected growth in aviation emissions - or 183 million tonnes of CO2 per year - would be saved if its plan was implemented in full. However, a large part of the saving would be achieved by other participants in the emissions trading scheme (ETS), which would sell emission allowances to the airlines. The plan would work by issuing airlines with emissions allowances, mostly free of charge, based on their average carbon use between 2004 and 2006. An airline that cut its emissions would be able to sell its surplus permits, while one that increased emissions would have to buy extra permits from industry or from other airlines. Environmentalists say Environment Commissioner Stavros Dimas wanted tougher action against airlines' emissions, but lost an internal battle following a huge lobbying campaign by industry. 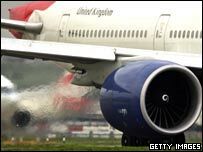 BBC Environment Analyst Roger Harrabin says the airlines have escaped a plan to make them buy their allowances at auction. "They have escaped with most of their privileged tax-free status intact. And perhaps most seriously, they don't have to account for emissions of other greenhouse gases, probably three times more powerful than CO2, that happen not to be included in the trading scheme," he says. The European Commission said it expected short-haul air tickets to rise by 1.8 euros (£1.20) to 9 euros each by 2020 - too little, environmentalists said, to deter people flying. But the Association of European Airlines (AEA), representing big carriers such as British Airways, Air France KLM and Lufthansa, said the proposals would force its members to buy emission permits. "It will be a burden and it might be a heavy burden," said AEA spokeswoman Francoise Humbert.